Aldershot Farnham & District’s runners won four of the ten team events at the South of England Cross Country Championships. The club had made its presence felt in the opening race of the day, the u15 boys’, when Harry Hyde finished fourth, Woody Jerome fifth, Charlie Wagstaff seventh and Ryan Martin eleventh for an emphatic victory. If the positions of Ed Henderson (seventeenth) and Max Duckworth (twentieth) had been added, AFD’s score would have still beaten Tonbridge’s total of 84 points. Aldershot Farnham & District’s runners won four of the ten team events at the South of England Cross Country Championships. Will Barnicoat, winner of the UK inter counties under-15s’ title last season, took the silver medal in the u17s’ race on Saturday, two seconds behind the reigning National champion in this age group, David Stone of Shaftesbury Barnet Harriers. The AFD man led Luke van Oudtshoorn (eleventh), Dylan Spencer (seventeenth) and Jack Johnson (26th) to a set of gold medals. The club had made its presence felt in the opening race of the day, the u15 boys’, when Harry Hyde finished fourth, Woody Jerome fifth, Charlie Wagstaff seventh and Ryan Martin eleventh for an emphatic victory. If the positions of Ed Henderson (seventeenth) and Max Duckworth (twentieth) had been added, AFD’s score would have still beaten Tonbridge’s total of 84 points. Tonbridge also came second to AFD in the senior men’s contest, where six athletes are required to score, but by a much narrower margin. Paul Rodgers, ninth, Luke Prior, twelfth, Phil Sewell, seventeenth, Ricky Harvie, eighteenth, Callum Charleston, 21st, and Sam Eglen, 28th, formed the victorious squad. Katriona Brown, fifteenth, Lizzie Squibbs, 21st, Megan Newton, 30th, and Niamh Reid-Smith, 31st, were the members of AFD’s quartet that took the u20 women’s crown. In the u20 men’s event, the club’s quartet of Max Heyden (tenth), Marcus Shantry (fifteenth), Jack Boswell (48th) and Robbie Coupland (67th) claimed the bronze medals. 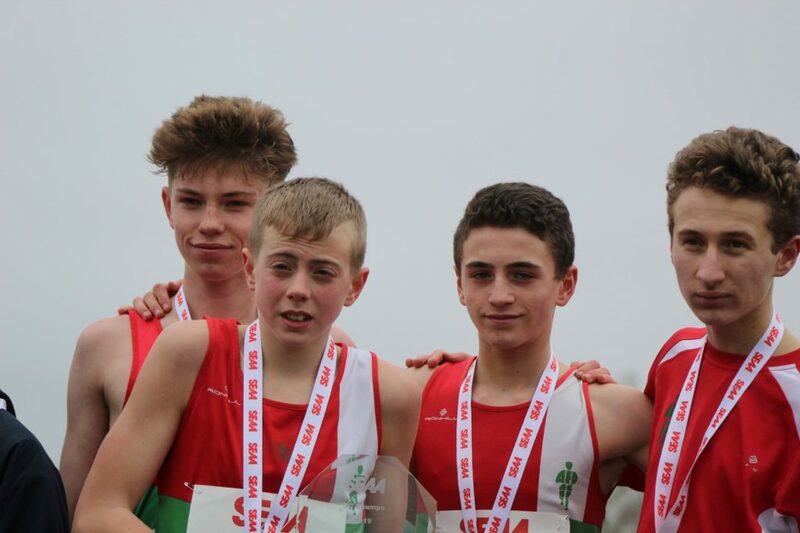 AFD were fourth in the u13 boys’ competition as was their lead runner, Dan Shattock. 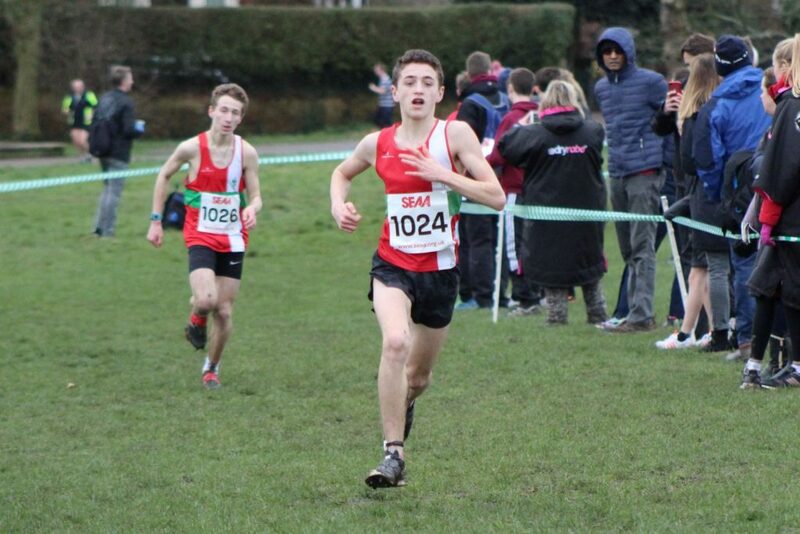 Will Barnicoat, winner of the UK inter counties under-15s’ title last season, took the silver medal in the u17s’ race on Saturday, two seconds behind the reigning National champion in this age group, David Stone of Shaftesbury Barnet Harriers. The AFD man led Luke van Oudtshoorn (eleventh), Dylan Spencer (seventeenth) and Jack Johnson (26th) to a set of gold medals. Tonbridge also came second to AFD in the senior men’s contest, where six athletes are required to score, but by a much narrower margin. Paul Rodgers, ninth, Luke Prior, twelfth, Phil Sewell, seventeenth, Ricky Harvie, eighteenth, Callum Charleston, 21st, and Sam Eglen, 28th, formed the victorious squad. Katriona Brown, fifteenth, Lizzie Squibbs, 21st, Megan Newton, 30th, and Niamh Reid-Smith, 31st, were the members of AFD’s quartet that took the u20 women’s crown. In the u20 men’s event, the club’s quartet of Max Heyden (tenth), Marcus Shantry (fifteenth), Jack Boswell (48th) and Robbie Coupland (67th) claimed the bronze medals. AFD were fourth in the u13 boys’ competition as was their lead runner, Dan Shattock.